The Sukothai. Beautiful 5* hotel designed by architects Neri & Hu. Great design and rooms. You can book it here. URBN. Cool eco-friendly hotel. They also have a nice burger restaurant. You can book it here. PuLi Hotel and Spa. Luxurious hotel with nice interior design. You can book it here. Les Suites Orient. 5* Boutique hotel at the Shanghai Bund right at Huangpu river. They have some charming rooms and a nice lounge and breakfast area. You can book it here. The 5* Grand Hyatt in the Jin Mao Tower with its 88 floors is worth a stay if you are not afraid of height. It has a nice rooftop bar called Cloud9. You can book it here. SSAW Narada Boutique Hotel Yu Garden. 4* hotel only a 5 min. walk from the line 10 metro station Yu Garden. You can book it here. Rock&Wood International Youth Hostel. Low-budget stay in a modern and clean atmosphere. You can book it here. Visited but not stayed at: Ahn Luh Resorts & Residences in Zhujiajiao. This complex is breathtakingly beautiful. Also just worth seeing its setting in the old buildings from Ming and Qing dynasties. You can book it here. Hakkasan. Fine Chinese dining on the Bund. They serve great dim sum as well. Dress code smart casual. Metro stop Nanjing East Rd. on lines 2+10. Crystal Jade. Dim Sum chain with various branches in town. Din Tai Fung has many branches in Shanghai, e.g. at Jing‘an Kerry Centre. There you can try a variety of Dim Sum. Pork + soft crab is a tasty one. Metro stop Jing‘an Temple on lines 2+7. Qimin Organic Hot Pot. Come here for some great hot pot experience. You get your own base soup and can toss in what you like – even harvest your own mushrooms from a tree trunk. It is located in Reel Mall. Metro stop Jing‘an Temple on lines 2+7. Royal Garden. Dim sum place located right in Zhongshan park. You get discount at lunch time. Ye Shanghai. Hip Chinese restaurant in the lively area of Xintiandi. They even have a signature cocktail called Yegroni. Metro Station Huangpi South Road line 1 or Xintiandi lines 10+12. Dongbeiren. Authentic local Chinese food from Northern China. Very good Shujiao Dumplings! South Beauty. The branch on 881 Yan‘an middle road has a nice setting with garden. The place serves Sichuan food that is not too spicy. Metro stop Jing‘an Temple on lines 2+7. Spicy Joint. Try a wide selection of Sichuan food for a good price. Xibei Youmian Cun. Cuisine from Xian area serving lamb, Roujiamo (meat burgers), Liang Pi (cold skin noodles). Yershari. Come here for Halal food from province Xinjiang. They serve home-made yoghurt and sheep milk tea as well. Ben Jia South Korean. Here you can taste some Korean table-BBQ. It comes with a variety of little side dishes and a large plate of salad to wrap your charcoal grilled food in. Metro stop Yan‘an West Road lines 3+4. Kyochon1991. Get the best Korean fried chicken here, super crispy. Dong Bei Lao Jia Jiao Zi Dian. Get Chinese dumplings on WuDing Road, corner WanHanDu Road. Good for families. Manne et Santé. Located in the French Concession area. Here you can eat Western inspired food or have coffee in a cute location. Just across the street is the book cafe, Han Yuan. Lost Bakery. Great place to hang out, eat sandwiches and have a coffee. Metro stop Jing‘an Temple on lines 2+7. Note: Restaurants on the Bund do discounts after 11pm since then the lights on Pudong area are switched off! You can follow locals on WeChat to stay informed about special nightlife promotions, here three accounts: "Neal", "Shixin", "Lukas". In the Three on the Bund building there are various restaurants, some designed by Chinese architects Neri & Hu. On the 4th floor you can find Jean-Georges where you can sip on a cocktail while enjoying the bright interior. Xintiandi is a nice trendy area to eat and drink. Try some Shanghai craft beer for example or listen to music bands. Metro stop Xintiandi lines 10+12. To get a glimpse of the Shanghai 20‘s visit the Jazz bar at the Peace Hotel. There are also other Jazz bars around the Bund area. Bar Rouge. This club has been in Shanghai since 2004. They have ladies‘ free nights every Thursday including free manicure. Vue Bar. Located on the 32nd floor of the Hyatt hotel. Features ladie‘s discount night every Wednesday. The bar of the Park Hyatt Hotel also has ladies‘ night on Wednesday with free flow sparkling wine. 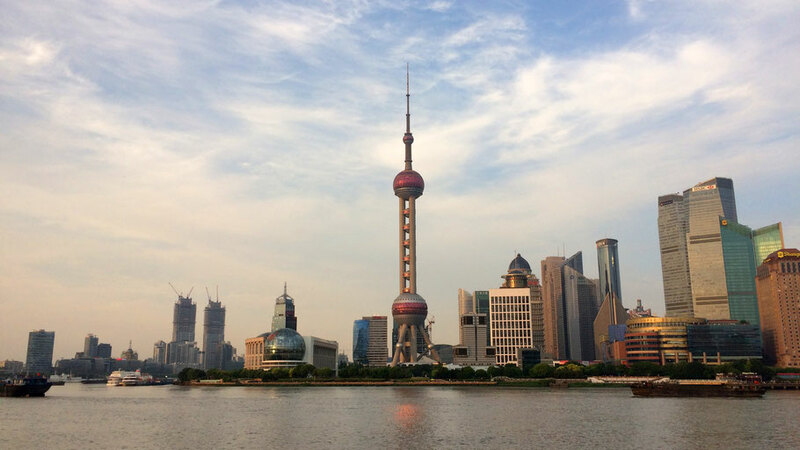 Take a stroll along the Bund called – Waitan by locals – for a view on the Pudong skyline (best in the evening, lights are turned off at 11pm). Shopping along one of the longest shopping roads of the world: Nan Jing Road. For Chinese art, paintings, calligraphy etc. visit the Shanghai Museum. Yu Yuan. When walking through the Yu Yuan Old Street you will feel that it is a very popular sight. Either come before 10am or just go with the crowd. Don‘t get terrified by the amount of people who want to cross the 9zigzag bridge. The queues move pretty fast in China and being on the bridge offers nice views. Also this way you get to the ticket entrance to the beautiful Yu Garden. Tianzifang is an old town area that has been successfully preserved (it was in danger to be destroyed). There you can do souvenir shopping, eat small snacks or have a glimpse into a local market (Taikang Road). Metro stop Dapuqiao on line 9. Strolling around the Old French Concession is a relaxing way of seeing more of Shanghai. The tree-lined roads lead to small cafes and stores. South Bund Fabric Market. Come here to have some clothes tailored! There are a lot of tailors in this space and it is fun to walk through it looking at the little booths. Two picks: Have a traditional Chinese dress called Qipao made at Annie's, Booth No. 186 or a modern Chinese-style jacket at Jenny Ding, Booth No. 273. Craving for a movie night with burgers and beer? Check out The Pearl. They show movies for free on Tuesdays. Together with timeoutshanghai the restaurant M Glam shows film screenings once a month. Free popcorn! The M restaurants are a cultural hub with various events. For a musical night check out the karaoke spots by KTV! An easy-to-do day trip: Jiading. You can reach Jiading by metro line 11, take the correct line until Jiading North final stop. From there you take a taxi (~12 kuai) to the Confucius Temple Kong Miao. The temple is small, nice and for free. Then walk into the old town and admire the lovely small alleys and the Fahua pagoda. Have lunch at Ythai and order their crispy chicken. Don‘t miss tea tasting at the Pu‘er Tea specialized tea house. Next door you have a lute academy where you can peek in. Sometimes they have evening shows. Jiading museum is nice as well and the Qiuxia park next to it is very charming, it closes at 4.30pm. Other places worth visiting by train are Hangzhou – to see the cradle of Chinese silk – and Suzhou, where star architect I.M. Pei designed the Suzhou museum.